"Self-medicated madness is our remit. Love, lust, lunacy & loss are our tales to tell. Music to lose your mind to..."
AlterRed's sound is like no other; they mix electronic beats and sounds with avant-garde piano, and then top it off with strong and soaring vocals. With an array of recognizable influences from Depeche Mode to David Bowie to The Dresden Dolls and IAMX, AlterRed's end result is a unique melting-pot of sound and imagery. AlterRed have made a dramatic and impressive impact on a wide variety of audiences, from the indie/electro crowds in London to the Synthpop and EBM crowds across Europe. After releasing three albums in Europe, AlterRed are poised to make their North American debut with the release of The Electro Creepshow. 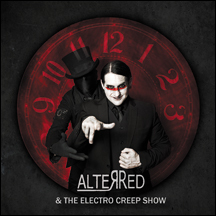 Re-mastered and assembled by AlterRed, the 15 tracks on The Electro Creepshow cover a wide variety of styles. From the Dark Electro Cabaret tales of "Dollstown," "As She Circles the Drain" and "Emily" to the haunting electro beats of "Spine," "And the Machine" and "And We Disappear," the duo of MikEy Altered and Vix Vain have created a style and sound that are truly like no other. One of the UK's best kept secrets is about to invade North America, are you ready?